What makes a handbell ensemble unique is how the music is produced. 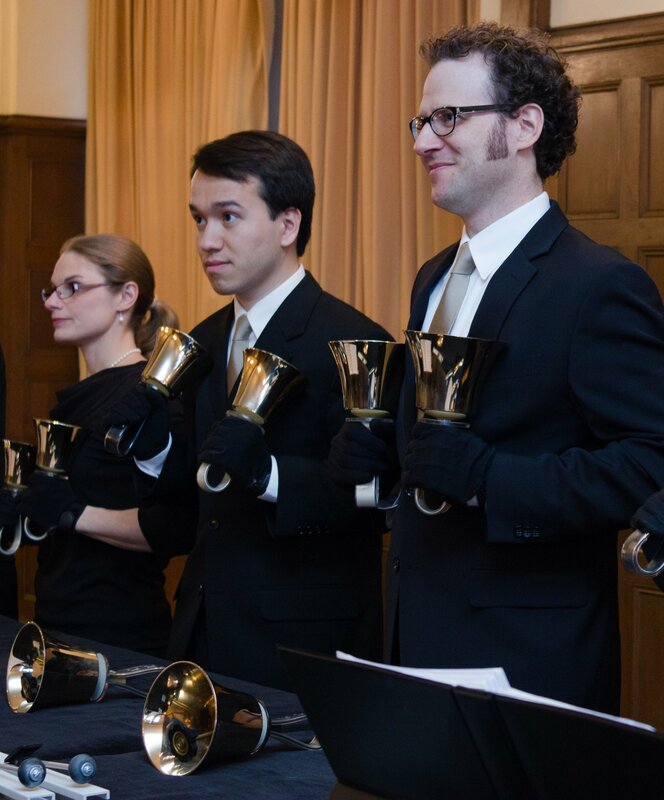 A team of musicians playing many individually tuned handbells creates one instrument. Each musician is responsible for up to twelve individual bells. 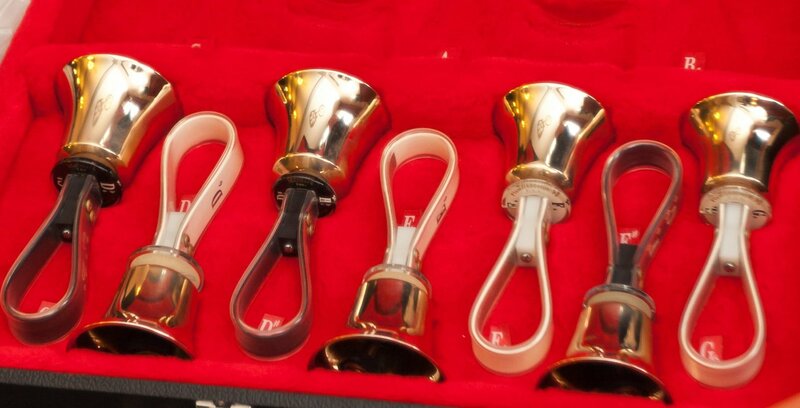 Each bell has an assigned pitch, much like each key on a piano. The musicians must work together to create a final performance. Musicians use a variety of techniques, including the use of mallets, to create many unique sounds. One handbell cannot create a performance; a cohesive ensemble, however, can perform music with incredible precision and expressive qualities that rival any great musical organization. The core instrument for Back Bay Ringers is our five and a half octave set of Malmark handbells. The bronze bells offer a wide variety of sonorities due to many special techniques developed for the instrument. In addition to ringing, musicians also frequently use mallets on the castings. Musicians may either mallet the bells while they are suspended by the handles, to create a gentle sustained sound, or while the castings are resting on the padded tables, which creates a short, percussive sound. BBR received a generous donation that made the purchase of our five and a half octaves of handbells possible. Choirchimes were invented by Malmark in the late 1970s as an alternative ringing instrument. The hollow aluminum tubes are designed with an external clapper and a slot on the side that resembles a tuning fork. Back Bay Ringers rings on a six-octave range of Choirchimes, the largest range currently available. The lower sixth and seventh octave Choirchimes stand on a specially designed rack and are gently malleted to provide a rich, resonant bass sound. Choirchimes are an excellent tool for music education, and BBR has proudly donated several two-octave sets to Boston area schools. To learn more about our donation program, visit our Boston Handbell Festival page. Whitechapel handbells were the first type of handbells brought to the United States in the early twentieth century. Beacon Hill resident Margaret Shurcliff was given a ten-bell set of Whitechapel handbells as a gift from the head of the Whitechapel foundry. It was that gift, and Mrs. Shurcliff’s enthusiasm for the instrument, that launched the growth of handbell ringing as a musical art. 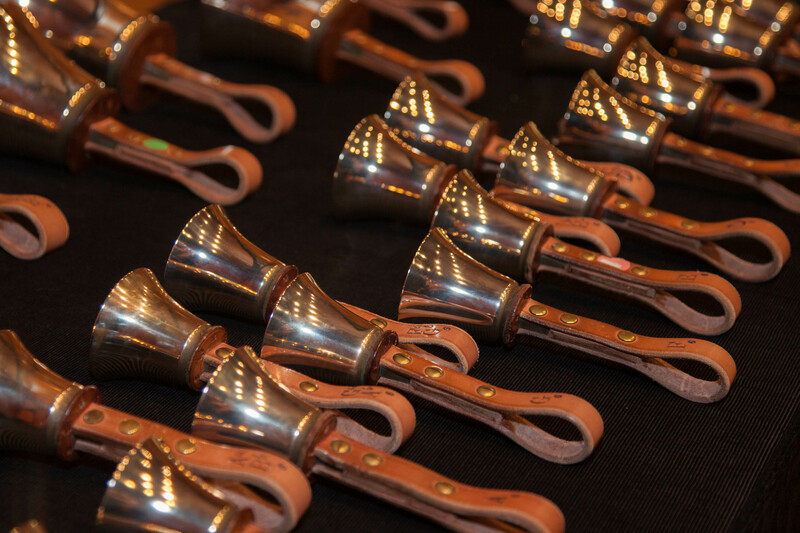 Back Bay Ringers received a generous donation of a nearly complete three-octave set of Whitechapel handbells in 2011. We are grateful for this gift and we enjoy utilizing these bells in our programs. For us, these bells represent a wonderful connection to the local history of the art form. 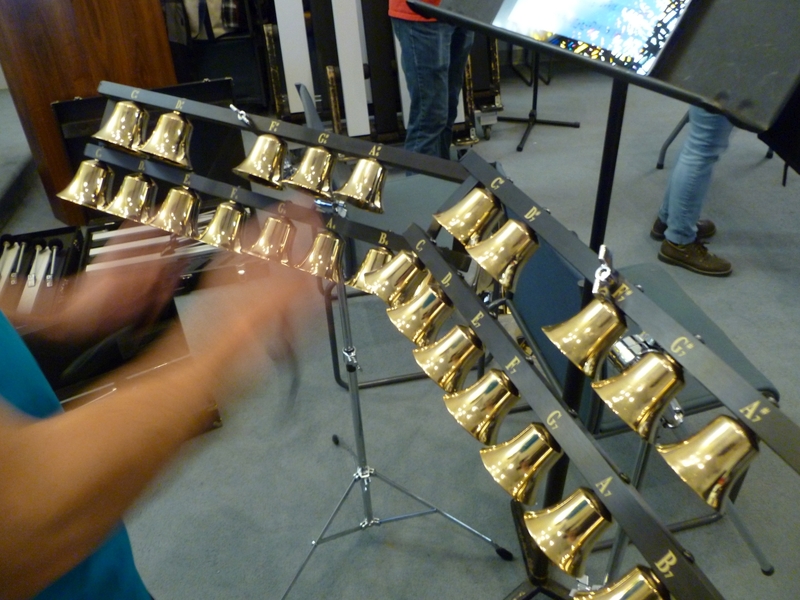 Recently, we received a donation that allowed us to purchase the C4 bell, completing our three-octave collection. Cymbells are a new innovation in handbells. 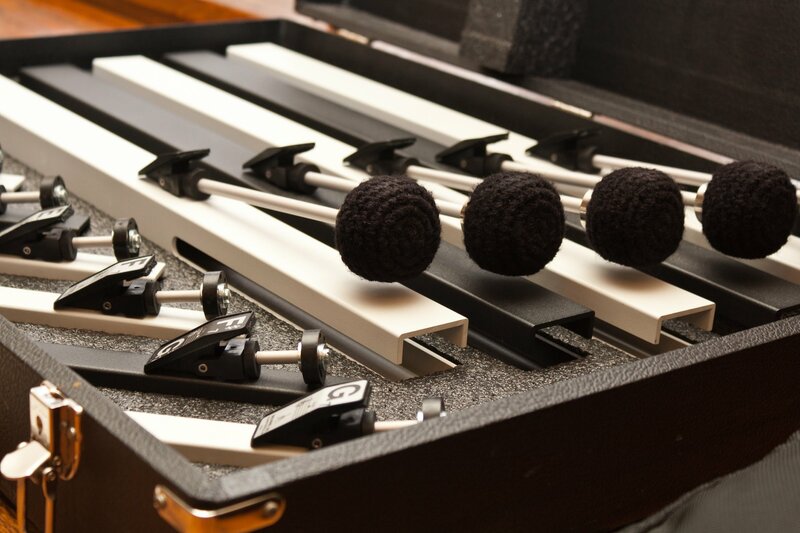 Designed with studio musicians in mind, Cymbells consist of handbell castings mounted on a rack and played by a musician striking the casting with mallets. BBR has utilized our two-octave set of Cymbells to highlight melodies and create antiphonal effects within a performance. Handbell composers and arrangers frequently add a variety of additional percussion instruments to handbell scores to add color and contrast. BBR has a wide collection of auxiliary percussion instruments including triangle, tambourine, finger cymbals, slap-stick, chime tree, and claves.